McCoy’s has unveiled new Muchos: a crescent-shaped folded tortilla crisp that taps into the growing popularity of Mexican food. Muchos is a corn, wheat and potato-based snack made with a blend of six spices and beans then coated with a Mexican-style seasoning. Launching in stores at the end of January, it will be available in a sharing bag pack size of 180g (RSP £1.99, outers of eight) in three flavours: Smoky Chilli Chicken, Nacho Cheese and Sour Cream & Onion. Exclusively for convenience, the Smoky Chilli Chicken and Nacho Cheese variants will also be available in an 80g Grab Bag (outers of 14) as a £1 PMP from 17 March. 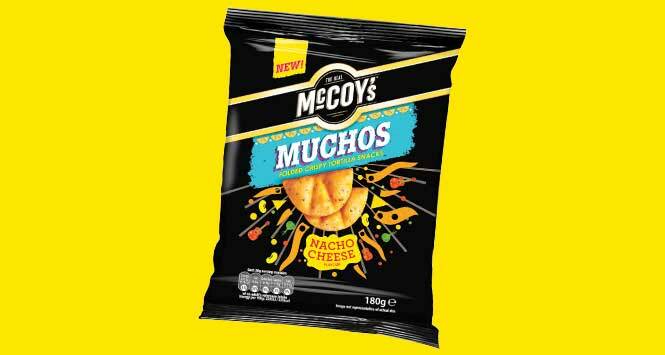 As KP Snacks’ largest NPD launch to date, the introduction of McCoy’s Muchos will be supported with a £4m investment including advertising and in-store campaigns later in the year. 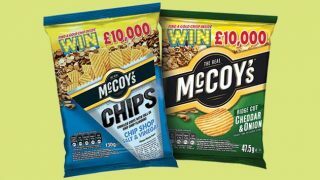 Claire Cooper, McCoy’s Marketing Manager, commented: “Sharing is now the second-largest area within Crisps, Nuts and Snacks, and continues to grow. We are very excited to launch such a new and unique Mexican-themed product into this arena, a much-needed injection of fun, flavour and innovation for the tortilla market”.